Few visual artists have been examined and mythologized as much as Vincent Van Gogh. He's been portrayed by the likes of Kirk Douglas, Benedict Cumberbatch and Tim Roth; had several documentaries made about his life; at least one magnificent animated film (Loving Vincent), had at least one song written about him, and even appeared as a character in two episodes of Doctor Who. It would seem arguable that there is not much more to be learned about him, or that perhaps the Romantic myth has overshadowed the man. That latter point is likely true even in this most recent biopic. At Eternity's Gate is the latest in Julian Schnabel's short but formidable filmography. Schanbel's films on various artists (painter Jean-Michel Basquiat, poet Reinaldo Arenas, editor Jean-Dominique Bauby, and musician Lou Reed) have always been somewhat experimental, focusing less on the huge events on the subject's life, and more on how each of these artists has seen the world, and therefore was inspired by it. At Eternity's Gate, which stars Willem Defoe as the tortured artist, is arguably his finest work to date, honing in on Vincent's fractured state of mind, moving between moments of joy, philosophy, and unbearable sadness. The film focuses on Vincent's most prolific period: his time in Arles, France; during these two years, he completed over 200 paintings, drawings, and watercolours. He also grappled with the how and why of creating his heart, discussing technique with fellow artist Paul Gaugin (Oscar Isaac), health and depression with his beloved brother Theo (Rupert Friend), as well as the various people who cross his path, in the town, and the asylums to which he is frequently consigned due to ill physical and mental health. The likely audience for this film are people would already be familiar with the important life events of Vincent, and Schabel and co-screenwriters Jean-Claude Carrière and Louise Kugelberg are fully aware of this. Therefore, the point is not to recreate his life, but try to understand his mind and heart, and recreate how he saw the world that he would bring so amazingly to life. Schabel and cinematographer Benoît Delhomme use close-ups and handheld cameras to evoke this understanding. Most of the scenes falls into two categories: Vincent with others and Vincent alone. When Vincent is with others, his loneliness and desparation are somehow more acute, either when he offers money to a local woman to spend the night with him, or when he tries to convince Gaugin not to leave him. Their discussions on how a work of art should be created (slowly or quickly, with purpose or with immediate intention) are shot and lit in such a way as to feel like you are sitting at their feetm, even as their argue in their different perspectives. With Theo, Vincent is the most loving and kind, with a wonderful moment between them even when Vincent is at a hospital and arguably his lowest point. With the people of the town, Vincent can be either respectful or forceful, feigning ignorance as to how his assertive nature could be perceived. But it is in Vincent's solitary moments when the film shines. His greatest love was sunlight, and how the sunlight brough the colours of nature to life. Delhomme gives us this alternating bright yellow and golden moments of sunlight, and Vincent in his element walking in nature and painting nature, coupled with moments when that beauty might turn to darkness, or when the pressure becomes too much. Coupled with Tatiana Lisovkaia's haunting score, and it is as much expressionism as Van Gogh's paintings. In any biopic, central performance is key, as a gateway to understanding the subject, and how we might know him or her better than we have before. 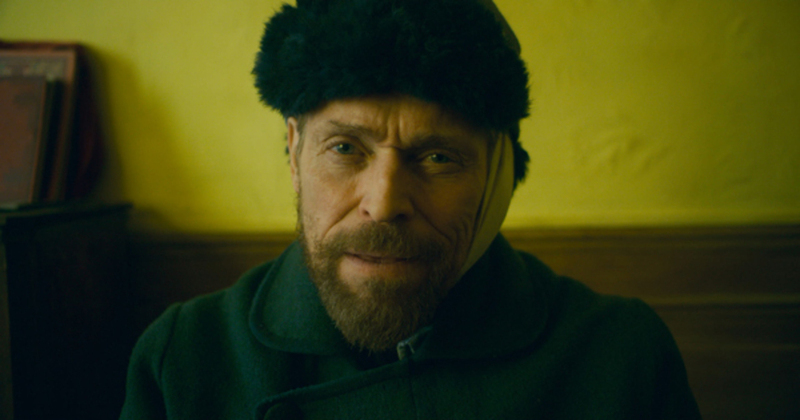 Dafoe seems at first glance to be an excellent choice for Vincent, and indeed, as one of the finest living actors, he gives the character the layered performance deserved. His Vincent swings for pure happiness to utter despair; to understanding where he has gone wrong to being oblivous to those around him whom he has injured. And while his performance is in most ways pitch-perfect, the age difference between Dafoe and Vincent is too obvious. The film focuses on Vicent's last two years, ages 35-37; Dafoe is 63. This is such a huge gap that it is painfully obvious in every shot; there is some youthful vitality and desperation that is lacking, and in scenes with other more age-appropriate actors, a constant reminder that Dafoe's performance, as good as it is, cannot overcome enough for it to not be distracting. Which brings it back to another distraction: the continues Romanticizing of the 'tortured artist'. Vincent lived in meager circumstances, selling only one painting in his lifetime, and living off support from Theo. Yes, he created some of the most beautiful paintings of all time, but that was arguably in spite of his circumstances, not because of them. Though the film also (perhaps because of greater contemporary awareness) directly addresses and evokes more accurate representations of the depression under which Vincent suffered, both in its expression, and how other reacted (or didn't) to it, and helped (or more often didn't). More of an (as stated) expressionist (and impressionist) view of Van Gogh's life rather than a standard biopic (Schnabel has admitted that some events were fabricated), At Eternity's Gate finds its strength in interpreting the life of the great artist, and in finding the cinematic route to understanding the how and why of Van Gogh's visions, both in their beauty and their sadness. At Eternity's Gate is currently in limited release in Canada and the USA.